FLOYD MAYWEATHER: "I TAKE MY HAT OFF TO VICTOR ORTIZ FOR STEPPING UP"
"Yeah, I chose Victor Oritz. I mean, there's always excuses when I fight; they say he's either too small, he's too slow or he's too old. I chose Victor Ortiz, a young, strong, solid champion and I think he brings excitement to the sport of boxing. You know, they say that I have a hard time with southpaws, but last time I checked, I was 41-0, so I don't think I really have too many problems with orthodox or southpaw, or a guy that can do both and can switch. Victor Ortiz is strong, he's solid, and he's the world champion. I've been out the sport for awhile now, so it's time for me to step up to the plate and do what I do best and that's go out there and perform well...I take my hat off to Victor Ortiz for stepping up and trying to help clean the sport up by taking the random blood and urine tests," stated undefeated pound-for-pound champion Floyd Mayweather, who gave us his first interview after officially announcing his return to the ring to face WBC welterweight champion Victor Ortiz on September 17. You don't want to miss what he had to say about his long-awaited return, Victor Ortiz, and much more. BT: So tell us about it, Floyd. Victor Ortiz on September 17th, right? FM: Yeah, I chose Victor Oritz. I mean, there's always excuses when I fight; they say he's either too small, he's too slow or he's too old. I chose Victor Ortiz, a young, strong, solid champion and I think he brings excitement to the sport of boxing. You know, they say that I have a hard time with southpaws, but last time I checked, I was 41-0, so I don't think I really have too many problems with orthodox or southpaw, or a guy that can do both and can switch. Victor Ortiz is strong, he's solid, and he's the world champion. I've been out the sport for awhile now, so it's time for me to step up to the plate and do what I do best and that's go out there and perform well. BT: You were at Victor Ortiz's fight when he defeated Andre Berto and won the title. Were you there scouting him at the time? FM: Actually, I was there just to watch the fight. Me and 50 Cent was in New York City and I told 50 Cent that I wanted to go see his house in Connecticut. Then 50 said, "That's a good idea. I haven't been to my house in over a year," so we decided to drive up to the fight on the way. We actually got to the fight around the end of the first round or the beginning of the second round. I was impressed with Victor Ortiz. Actually, I was impressed with both guys. I think Victor Ortiz is a lot stronger at 147 than he was at 140. But after the fight, you know, that's when everybody kept on saying they think Mayweather and Ortiz is fighting next. BT: I don't even think this question needs to be asked, but I'll throw it out there just to make it official. Will you and Victor be taking random Olmypic-style blood and urine tests leading all the way up until the fight? FM: Yes! Absolutely! Anybody that I face will be taking the random blood and the random urine tests. I will be doing the same thing also. I always want to be on that even playing field. I know that Andre Berto had said some things about Victor Ortiz, but he agreed to everything, so as of right now, I don't have a problem with Victor Ortiz. BT: Have you guys decided on a venue yet? In the past, there were rumors about you fighting at Cowboys Stadium. Are you picking up shop and heading down to Texas or is it going to be in Vegas? FM: We don't have a particular venue at this time, but September 17th, that is my official date. As of right now, the venue is up in the air. The only thing we really know right now is the date and the opponent. We're getting the press tour together; me and Victor Ortiz will be having a press conference in the UK too and I'm putting on a training exhibition over there. BT: Obviously you're in a position where you don't need titles anymore, but is Ortiz's WBC welterweight title even going to be on the line? Technically, you can probably say that's still your title that he's holding since nobody ever beat you for it. FM: They never took my title from me. I relinquished it. A lot of people probably didn't know, but at one particular time, I was the WBC jr. middleweight champion and the WBC welterweight champion at the same time. I think a lot of fans didn't know that. I wanted to fight some fights at 154 and fight some fights at 147, but they said I couldn't. At one particular time, I wanted to be like the throwback fighters. But we'll see. FM: (Cutting in) Everything was just speculation and rumors. Somebody put them rumors out there. Victor Ortiz didn't have a date, I didn't have a date, so I guess Al Haymon and Richard Schaefer got to communicating and talking and they said we should make this fight happen since it's been out there already. The world has been talking about this fight anyway since we weren't able to get a fight done with Pacquiao because he didn't want to take the random urine and blood tests. Like I said before, Victor Ortiz, he fought hard. He had some ups and downs in his career, but he's a world champion and I have to go out there and do what I have to do. I have to go out there and show the fans that even with close to two years off, about a year and half off, I'm still sharp mentally and physically. BT: I'm sure you could have had your pick of opponents, but how important was it for you to face a young, strong, and hungry world champion like Victor Ortiz? FM: You know, you got some champions that are older, you got some guys that are Hall of Fame veterans, you got some guys that are young, strong bulldogs and you got some that are very wise, slick veteran fighters. The only thing I want to do is fight the best they got out there. I really feel bad for the fans that have been waiting for the Pacquiao fight for so long. It's just, if I fight a fighter, I want to make sure that fighter is 100% all-pure and all-natural. He just doesn't want to take these same tests. I work too hard too take a chance of losing to a fighter that's cheating. I'm not saying that Manny Pacquiao is cheating. That just goes for any fighter. 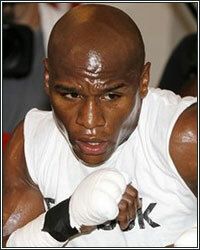 Any fighter that's getting in the ring with Floyd Mayweather must take the random blood and random urine tests. I must do the same; it doesn't just go for my opponent. I'm the type of guy that, you know, I truly believe that no fighter on earth can beat me. Once a fighter is put in front of me, I feel that no fighter on earth can beat me. I don't even feel no fighter can beat me when I'm at my worst. Like I said before, if you say you the best, take the tests. I'm the best, that's why I'm willing to take the tests. That's why we got some shirts coming out; if your the best, take the tests! BT: (Laughing) If your the best, take the tests. That's catchy. So you're gonna have shirts that say that? FM: Absolutely! I'm gonna wear them in training camp. BT: When do you plan on starting training camp? FM: In July, I'm gonna start training camp...actually, I've been playing a lot of basketball in Las Vegas with some of the kids that's going to the NBA draft. I've been running just a little bit, playing a little basketball, and just working in the gym on my upper body. BT: Well Floyd, I know we'll be getting much more from you, but is there anything else you want to say before we wrap things up for now? FM: I take my hat off to Victor Ortiz for stepping up and trying to help clean the sport up by taking the random blood and urine tests.